Can you tell me the name of the road that crosses this bridge? If you know leave your answer in the comment box below. I will pick a random winner from all correct entries on Tuesday morning, and they will go on to the ‘Winners wall’ for the month. At the end of the month one of those on the wall will be picked to receive a prize. The prize for March is a set of my Edinburgh coasters. Printed right here in Scotland. Each one is a premium glossy 9cm x 9cm hardboard coaster, they’re great quality and the colours really pop. Your comment will not show up until the winner is announced. Keep an eye on my facebook and twitter feeds for clues if they are needed later today, and I will pick a winner for the Winners Wall tomorrow afternoon. I hope you join us to play along and keep looking up and noticing the beauty in the everyday, you never know where I will be sketching next! If you would like to buy a set of my coasters for 12.95 plus postage then you can order one HERE from my Etsy shop. 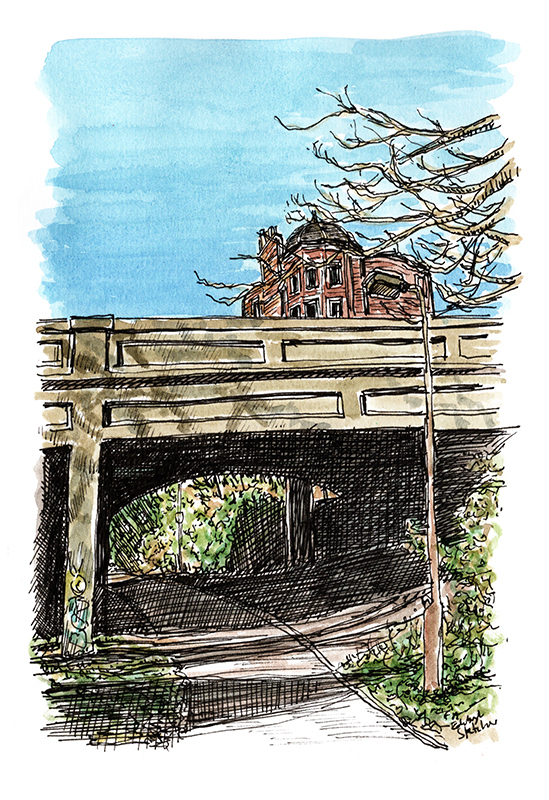 #WhereArtI Answer – March 18th: This bridge carries Great Junction Street over the cycle path to Leith. Nick Smith was randomly picked from the correct answers to go into this month’s prize draw. Thanks for playing, more next Monday. Great Junction street ….just walked over bridge and recognised the brownstone building. Had seen your sketch & it’s looked familiar but as there are several bridges crossing I couldn’t be sure but positive now. This is where Great Junction Street crosses the NEN and Water of Leith path. The road that crosses this bridge is Great Junction Street. Great Junction Street. Don’t routinely walk this way but the cupped roof looked familiar. I think that’s North Fort Street. There used to be a railway goods yard and wharf next to where you are standing. It’s Great Junction Street, at the corner with Ferry Road, Coburg St.
I’m guessing that is Great Junction Street, though usually pass through in the opposite direction, so may be wrong in my thinking.